The list of courses offered by Achievers University Owo are displayed on this page. Candidates who wish to apply through JAMB should click on any of the courses to see the course requirements. 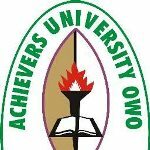 Achievers University is in Owo, Ondo State Nigeria. The university is a private-sector initiative, established in 2007 and accredited by the National Universities Commission. It is located on land in the Idasen community of Owo, consisting of Ulale 1, Ulale 11, Ulema, Ijegunma, Isijogun and Amurin Elegba (formerly Amurin,Ogain). The university sprang from the Achievers Group of Education and Training Organization, located in Ibadan Oyo State of Nigeria owned and run by Mr Bode Ayorinde and other educationalists. The university commenced academic activities during the 2007/2008 academic session. In the Nigerian National University Commission annual university rankings for 2013, it was rated 53rd. In July 2012 it was one of the seven private universities in Nigeria to have its operating license suspended as part of a clampdown on private institutions offering unapproved or low-quality courses and substandard facilities. The licence was restored on July 17, 2012 following an inspection by the National Universities Commission.